It all started on a summer day when founder of OneLeg, Susanne Schmidt, was working in her garden at her home in Fredensborg, Denmark. A keen gardener, Susanne was beginning to experience pain in her knees and back while kneeling in the garden. To relieve the burden on her back and knees she started to use a traditional paving stool to sit on which made a real difference. However, there were several disadvantages to the paving stool. First and foremost, it was made from solid wood and was therefore heavy and difficult to move around in the garden. The foot was too narrow which made it sink into the soil and the paving stool could not be used indoors or on tiles. Finally, yet most importantly Susanne found it difficult to keep her balance while sitting on the stool and it would tip over as soon as she stood up. Susanne realised that many people like her suffered with discomfort when working in an awkward position and she decided to take action. 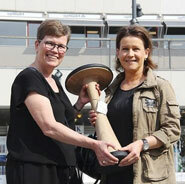 Taking the idea of the traditional paving stool Susanne and her friend Jens Andersen developed the OneLeg stool in 2011. The goal was, and still is, to enable gardeners, amongst others, to protect their body when working in awkward positions and to increase their pleasure in the workplace. It soon became clear that the OneLeg stool is also great for many other tasks and uses other than just gardening. It can be extremely useful, both indoors and out, for children and adults in areas such as healthcare, offices, institutions and schools. Knowing of our reputation as a British furniture manufacturer and supplier to the educational sector, Susanne approached us here at Gopak Ltd to see if we would be interested in marketing the stool in the UK. We started by introducing the stool to schools and other places of learning and the opportunity has now arisen to marketing the stool into the garden and home sector in the UK. This has led to the launch, www.oneleg.co.uk a site dedicated to the OneLeg stool, where you can find out everything you need to know about this fantastic, ergonomic and dynamic product. Susanne realized that awkward working positions troubled many like herself and decided to take action. Based on the traditional paving stool Susanne and her friend Jens Andersen developed in 2011 the OneLeg stool, as we know it today. The goal was, and still is, to enable garden owners, amongst others, to spare their body for awkward working positions and to increase their work pleasure.